Freshman Juan Albin hits a volley during the doubles match against Missouri Valley on Saturday afternoon. 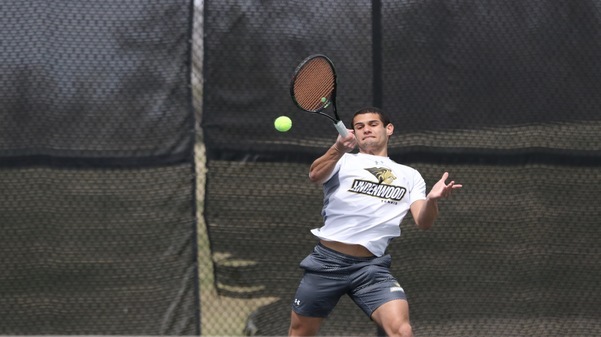 The Lions defeated the Missouri Valley College Vikings with two clutch victories for a 5-2 score on Saturday afternoon in the tennis courts on campus. The encounter started with doubles and six Lions competing. Theo Butaeye from France teamed up with Juan Albin to win 6-3. Senior Hector Horcajada and Logan Orr earned a close 7-6 win as well in the doubles competition to give the Lions the team point. As partners, they both find themselves with three consecutive wins. In singles, Guillaume Teste took the win in a close fashion in both of his matches by scores of 7-5, 7-5. Similarly, senior Michele Gaspari won his two sets 7-5 and 6-1. Butaeye and Albin each picked two wins as well. Orr, a sophomore, battled in three sets but lost 7-6, 2-6 and 10-12. The Lions are now 2-7 overall and will host William Woods on Tuesday at 2 p.m.